Turning out our horses is something most of us do without thinking about. But what hidden dangers are our horses sharing their fields with? Many plants, trees and hedges are poisonous to horses and ponies when ingested and not all are easy to recognise. 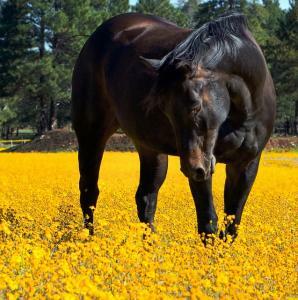 To avoid poisoning, it is important to be able to differentiate harmless plants from highly toxic ones in your horses’ paddocks. Some of the most common poisonous plants and trees are listed below so if you happen to detect any of these in the field, pull them up by the root and burn them so the pollen cannot spread. If you are thinking about using herbicides, speak to a professional before allowing your horses back in the paddock afterwards. It is always best to wait until heavy rainfall has washed the chemicals away before doing so. Any poisonous trees and hedges should be fenced off so their overhanging leaves don’t pose a danger to horses grazing nearby. Because the effects of most poisonous plants are cumulative, it isn’t always easy detecting a problem until it is too late. If symptoms do show, they are likely to include breathing difficulties, restlessness, lethargy/depression, loss of appetite, convulsions and visible signs of pain. 1) Ragwort is a poisonous plant that produces lots of highly toxic seeds, which are easily and widely dispersed by the wind. Horses don’t need to consume much of this plant to suffer liver failure and complete deterioration. In fact, ragwort is toxic enough to also pose a threat to humans, so make sure you always wear gloves when handling it. The effects of ragwort accumulate over a period of time, leading ultimately to catastrophic symptoms. Because younger plants are believed to taste less bitter than mature ragwort, it is likely that horses consume more of it without realising. Dead ragwort is just as toxic to a horse as the living plant, so make sure that hay and haylage isn't harbouring it. Ragwort starts appearing from early spring onwards and is instantly recognisable for its long green stems stretching up to bright yellow rosettes. Ideally, ragwort should be removed before it flowers and this is best done after rainfall when the ground is soft and plants can be pulled up by their roots. 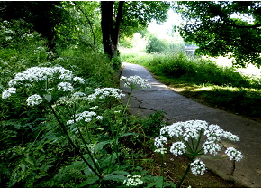 2) Hemlock is a common weed found in fields and is characterised by long stems (growing over 6 ft tall), with purple spotting and small clusters of white flowers. The roots and seeds contain the harmful toxins, or alkaloids, that cause respiratory paralysis. Hemlock poison is fast-acting and usually brings death fairly quickly. Typical early-warning signs are excessive salivation, loose and frequent stools, muscle weakness and tremors, disorientation and coma. 3) Foxglove is more of a garden plant than one you might find in fields, however, it is not unheard of for foxglove to get harvested with hay, so always be vigilant. Foxglove is also thought to be more palatable when harvested and as little as 100g of it can prove fatal. The plant is poisonous to other animals beside horses and will also harm humans. It is characterised by brightly coloured, tubular flowers along a long, leafy stem. 4) Buttercups are commonly found in pastures and can cause mouth ulcers and blistering if consumed by grazing horses. In small quantities, buttercups aren’t too threatening but they can still cause stomach upsets and general discomfort. In their dried form i.e. when harvested in hay and haylage, buttercups are no longer harmful so you needn’t worry. 5) The berries and foliage of Deadly and Woody Nightshade are highly toxic yet both are described as naturally distasteful and are less commonly eaten by grazing horses. Nightshade is found in open fields and pastures, in wooded areas and in wild growth at the roadside. The plant is tall with purple, bell-shaped flowers and sweet, faintly scented berries. Beside poisonous plants, there are also a number of hedges and trees that are toxic to horses when ingested. These should be fenced off or cut down to prevent accidental poisoning. Sycamore seeds are linked to Equine Atypical Myopathy - a serious condition with a high mortality rate. Sycamore seeds even when on the ground for a long while can still be just as toxic (as far a research has yet shown) So don't think they'l be ok now for your horse/pony to eat. Does oak not depend on if it is the leaves or scorn and when one or the other is green or dried. Is bracken not also toxic either green or dried ? Thank you for all your comments and sorry to hear about your loss Diane. Mil - It is the acorns from an oak tree which are poisonous and some horses can develop a taste for them! They can result in colic. Bracken is also toxic, fresh or dried generally horses wont eat fresh bracken unless there is nothing else to eat. Horsetail is also poisonous. Destroys Vit B1 in the horse's body. Its worth google-ing this plant. Buttercups in haylage is NOT a guarantee that the toxic elements have dried and evaporated as haylage is NOT a DRY forage. It is baled when around 40-60% moisture. I would like it if someone in the world would test for buttercup toxin in haylage to put this issue to rest. I read everywhere that buttercup in haylage is okay - yet my horse was very ill on it, and only recovered once the buttercup haylage was stopped. (There wasn't much buttercup in the haylage BTW) It was very good quality haylage! So please be careful with buttercup in haylage - it's not wise to presume it's safe and disregard it as a possible toxic reaction you're horse may be showing. My horse likes nothing better than young bracken shoots. I have to monitor the field every day when it starts to grow. He eats it, given the chance, even when there's loads of grass. Sycamore is the biggest problem I have. It's not even in my field; it's my neighbours & they also have horses. Hi Hazel. Iâve not had an animal incurred by crows but a few years ago I had a terminally ill pony who used to spend a lot of time lying down. I was shocked to quite often see crows sitting on and walking around on him. They obviously knew they could get away with it. I remember listening to. Jeremy Vine phone in on problems with seagulls a couple of years ago attacking pets in gardens.